- A romantic curiosity, historically significant but totally unsuited to modern life. Nick Alston used the announcement of his stepping down from the role of Essex Police and Crime Commissioner at the next election as an opportunity to state a view about how we do policing. While it was picked up by local media, I believe it is one which is deserving of much wider coverage and debate. Quite simply, he thinks that foot patrols, the beloved ‘Bobby on the Beat’, is an outdated and ineffective way to try to police 21st century Britain; that the resources supporting it would be better used elsewhere. And I think he is correct. The public clamour for visible foot patrols has frequently been described as “harking back to a golden age of policing which never existed”. 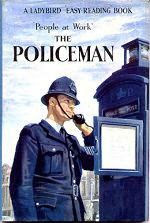 The principle is often associated with references to ‘Dixon of Dock Green’ – a TV series which ran from 1955 to 1976 and which itself was a spin-off from a feature film, ‘The Blue Lamp' from 1950. In which the principal Bobby on the Beat was shot and killed. Despite this, Sir Ian Blair is credited with trying to perpetuate the concept in 2002, while Deputy Commissioner of the Met, by inventing Police Community Support Officers as a cheaper way of providing visible, reassuring foot policing. Why do we, almost uniquely in public service, try to cling on to the methods of the 1950s in policing? Times change, the way in which we live has changed and technology has made life in 2015 in many ways unrecognisable from sixty years earlier. Hospitals, paramedics, firefighters, schools, social services – the list of agencies which have moved with the times is virtually endless. But we cling stubbornly to a romantic notion of a man or woman wandering around a small area, smiling and chatting, admonishing now and then and making the people who see them feel safe, apparently. If you have the opportunity to speak to those who actually did street policing in the 50s and 60s – as I, fortunately, do quite often – you will learn that it really wasn’t all smiles and stroking small animals. Policing was confrontational, in many ways much more so than today. Foot patrols were the default because there was no real alternative. Far fewer officers could actually drive vehicles for one thing; more importantly communication with them was difficult – there were no radios, no mobile phones or pagers. Messages got to officers in one of two ways –either the Police Box or Post, where a flashing light would alert the passing officer to a message, or another officer being sent to find the patroller to pass it on by word of mouth. In order to make this work officers were assigned to relatively small beats and required to make regular ‘rings’ – calls in to the station from a box or post to see if there was anything new to learn and also to confirm they were where they should be. The regimented discipline which required them to remain on their beat was part of the best system of command and control which technology then allowed. By the early 1970s things had changed, radios and the greater availability of vehicles had led to the adoption of the ‘Unit Beat Scheme’, almost always referred to as Panda Cars. In the same way as modern leaders have embraced advances in technology and integrated them into policing, those in command in the mid 60s saw the opportunity to modernise and mechanise and provide a better service. But the mid-60s also saw the rise of challenge to police authority, fuelled in no small way by disgraceful corruption cases, free-thinking media and energised lawyers supporting victims. Though the two developments were separate and parallel, many viewed them as cause and effect. Bobbies in cars didn’t speak to the public, hence they were becoming aloof, unapproachable and remote. In 1972-3 an experiment was conducted in Kansas City to see what effect patrolling officers had on reported crime, by varying the levels of patrol across discrete but similar beats from none to saturation level. The short answer is there was no discernible difference, in reported crime, fear of crime or public satisfaction. The details of the experiment are freely available, for example HERE . I read this paper at Bramshill in 1984 and was fascinated, as it seemed to point against many of the commonly-held beliefs in policing that we were still trying to serve. I then came across some other research (which I now cannot find but would very much like to) which said that on average an officer on foot patrol would pass within a quarter of a mile of a burglary or robbery in progress once every (I think) 12 years. It might have been 2 years, or 22 years, I cannot remember but it is largely irrelevant, since it went on to point out that, even if the officer were aware of the crime, he/she would not necessarily thereafter be able to prevent it or apprehend the perpetrator. So much for the reassurance of foot patrols. I took this thinking with me throughout my police journey, from London to Yorkshire then Surrey and back to London. Ploughing the major crime / covert policing furrow that I did I never had the chance to implement my ideas, but I still spoke about them. And got sideways glances and rolled eyes when I did. It was a heresy, just as some commentators are now describing Nick Alston’s views. What are the justifications for foot patrols? Two main ones I think, first community intelligence – the public police officers speak to are their eyes and ears is the common phrase. Are they, really? I am sure there will be anecdotal evidence of snippets passed on which have resulted in successful operations and improvements to community life. Equally there will be many other officers who, like me, never had a sniff of useful information from anybody who approached me on foot patrol. But in any case, now everyone has a phone, most a mobile phone. There is Twitter, Facebook, email, Whatsapp (for the moment), Snapchat, Instagram and hundreds of other apps I have never heard of. Do we really think that anybody will not pass information on unless they can do it face to face? When it can be done in those ways remotely, no meeting, where nobody can see and indeed with relative ease, anonymously? Reassurance is the other aim of foot patrols, we are told. By which is meant making people feel safe when they see a Bobby on the bet. Which is fine, for the individual actually seeing that Bobby at that time (and assuming they haven’t read the Kansas City experiment). There are though a few holes in this argument. First, the vast majority of this country is simply unsuited to foot patrol. Outside of the cities and large towns each ‘beat’ is just too big to be patrolled on foot. Rural areas have never really had foot patrol, sometimes bicycles but mostly motor-cycles or cars. Even the Ladybird book from the 1960s gives a simple and graphic snapshot of how policing was then. (Although if you do Google it, make sure you get the real one, not the very funny spoof). In the cities, the concentration of residents, residences and places of work means that the actual visibility of a patrolling officer in terms of the percentage of the population is similarly low. Think of it like penetration of the market. Let’s say London’s residential and working population is sitting at 10 million people at some point during the night, there are some 58000 individual streets and we know there are less than 800 officers on duty. Even in the impossible event that all these were on foot patrol (actually at least 700 of them will not be) each one would have to cover 70-odd streets to give everybody a chance of seeing them. If everybody else is awake, on the street or looking out of the window and remaining stationary. This is the absurdity of foot patrol as reassurance – your chance of being reassured is many, many thousands to one. The question I would like considered by police leaders and especially by the public is this: What is more reassuring, seeing a police officer walking past you once or twice a year or knowing that, when you need them, a phone call will bring two highly-trained efficient officers to you within minutes? A good analogy is with breakdown cover. Would you sign up with the firm which says they have three vans driving around your town and if they see you broken down they will stop and fix your car, or with the company which promises to attend your breakdown within 30 minutes if you phone them? My plan for action? Put the scarce resources currently used for local or neighbourhood foot patrols into making sure there is an excellent response to calls from the public. Calling for police for good reason to be told there is nobody available is not going to work. What about that PC handing out cards to kids in the street, or the one sipping coffee at the day centre? How are they reassuring me when somebody is breaking into my car or spraying graffiti on the bus shelter? Then, make the response meaningful – we need quickly to rid the community of the mindset they have been railroaded into that it isn’t worth telling the police because nothing will be done about it. It is really difficult to get police to respond to some calls still – even if you know what you are talking about and point out the actual offences which are being committed as you speak. Yes, that was my recent experience in Suffolk, I shudder to think how those without my background view such antics. The community can be your eyes and ears, but what is the point if the brain and body will not respond to the messages? This can only be achieved by prompt, efficient and decisive response becoming the norm. The public will then trust that calling the police is not the futile exercise it so often is at the moment. Lastly, police leaders – including PCCs – must have the courage to tell the community how it is. Yes, of course listen to their concerns and priorities but you have been seduced for 50 years into trying to deliver the results the public wants by the methods they (misguidedly) think they need. We would never accept the community dictating methods to firefighters or the NHS, why do we allow it in policing? Police must listen to the public but the public must also listen to the Police. Its leaders must be permitted to use their professional knowledge and judgement to deliver results in the most efficient way – which, in the 21st century, cannot include a romantic notion of adhering to a past perceived as glorious.